For AP Stats teachers, this is the time of year where we move from innocent ideas like scatterplots and experimental design, and into uncharted waters; those topics which require sharper focus, and more time and reflection to develop properly. Sampling distributions, the Central Limit Theorem, confidence intervals and hypothesis testing…new and scary ideas. With the crush to cover content before May, it’s easy to fall into traps where we shortchange discovery and real meaning and replace them with quick tricks. Here I present one of my least favorite Statistics “tricks”, and hope you “Nix this Trick”! “Nix The Tricks” is a powerful, free document for math teachers of all grades; a crowdsourced collection of math shortcuts and well-intentioned devices teachers employ to assist students with math mechanics; devices which ultimately under-cut student understanding of mathematics. Along with the tricks are suggestions for developing math concepts in your classroom without tricks; encouraging communication of ideas and language. It’s a labor of love, compiled and edited by Tina Cardone, who I admire for her dedication to this project. Some of my ideas from a blog post last year on phrases from math class which need to be expunged have been absorbed into Nix The Tricks, and I am thrilled to have had even a small part in building this document. Share it with your math friends, and let the debates begin! Back to Stats-world, and a phrase we need to Nix. It’s time for hypothesis testing, a new world of strange symbols for the null and alternate hypothesis, lots of conditions and tests to think about, and making logical connections between computed values and real-life consequences. Writing tight, meaningful conclusions takes practice, revision, and patience. But why struggle, when we have a cute shortcut? When the P is low, reject the Ho! This is the short version of the general argument that when we have a sufficiently low P-vale (below alpha), we have evidence against the null hypothesis, and in favor of the alternate. But why go through all of this meaning, when we can talk about Hos in math class! So, what’s wrong with this catchy phrase? Well, first, and probably most importantly, it’s damn offensive. For teachers, talking about Hos in class, or even providing a “giggle” momnent about the idea, is out of bounds. We all get that, right? Good. In stats-world, the problem with this phraise is that it provides students an excuse to not develop real understanding about the connection between P-Values, Alpha, and the null hypothesis. As an AP Reader, I enjoy the opportunity to see how students craft their conclusions to a hypothesis test. In 2012, I read question 4, which was a full 2-proportion z-test. It was fascinating to observe the clear differences between the written approaches to conclusions; which textbook they probably used, what mnemonic devices did their teacher push, how much attention was paid to written practice. In addition, while many approaches relied upon a canned template, where students simply fill in blanks (with mixed success), I also enjoyed well-developed explanations which demonstrate clear evidence of understanding of the logic of hypothesis testing. A strong conclusion has linkage between a computed P-value and a defined significance level (alpha). This is the computation piece. The art of statistical writing is taking this numerical result and using it to reach a conclusion about our population. My document camera is also a valuable resource here. 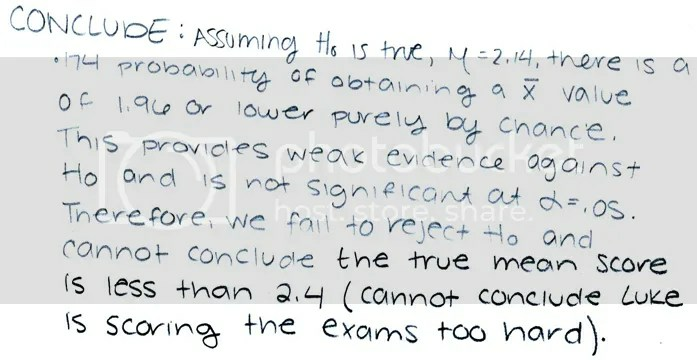 As an opener, I’ll have students examine a homework problem, and write their conclusion on an index card. Random cards are selected and critiqued. As many Stats teachers head toward their hypothesis testing units, let work together to Nix this Trick, and improve student writing!